Those look disgusting. Mr. H. says so too. I guess we'll have to try them to find out though. I wonder if the blogger would mind if I removed the bacon from that recipe. xD I mean, I don't even like bacon by itself in the first place. I checked the blog, though, and some of her other recipes look really, really good. (: My mouth is watering. Yum! Bacon cookies and ham soda! Ananka?? i have some info about some huge underground tunnels that are underneath Liverpool, England. If you have an email address i dont mind emailing you about them. at first im was like "ew! how could that taste good?" but then i really thought about it. 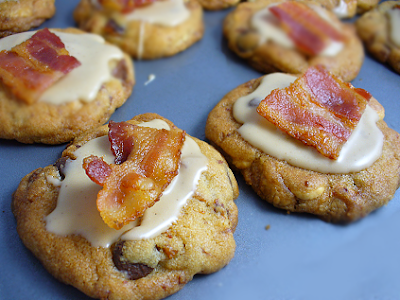 i think it would taste delicious.try mentally put the flavors of bacon and cookies together. still, i'd rather have them seperatley. Eeew! I can't believe she eats that! But bacon with maple syrup is really good. Or breakfast sausages with maple syrup. Mmm. Bacon tastes good with maple syrup, but chocolate? still does look weird. ( i've tried turkey bacon, did not like it) just wonderiing, i have a book i'm writing do u recomend any publishers? Laura: Yes, please! Send them to kikistrike@gmail. I've heard of the tunnels, but I don't know that much about them, so I'm really curious to see what you have! FooFoo: What kind of book is it? The best advice is usually to think of books that influenced you (or that are similar to yours) and hunt down their publishers. Wow. How many of you guys are vegetarians? When I want to have BLT and there's no bacon, sometimes I make "fakin' bacon," which is cold cuts fried in bacon fat (which we save after doing real bacon). It can't compare, but it's better that nothing. Bacon/Ham is no good for me. it isnt kosher and it isnt halal.